Successfully Added 64GB Multi-functional USB Flashdisk - Triple iOS, Android, Windows Interface, High Speed USB 2.0 to your Shopping Cart. I LOVE IT! I really highly recommend this product! I only needed to download the app "i-USB-Storer" and I was able to easily backup photos. That was the main reason I wanted it but I'm sure there's no problem backing up contacts, etc. 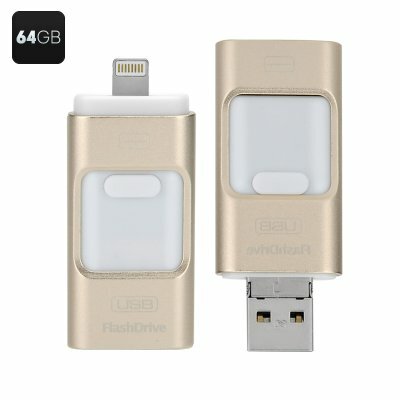 Be careful because some similar products on the market only allow transfer of photo from the usb device to the phone and not the other way around. This product definitely does backup photos and videos and 64G is very generous. The only thing I was disappointed about was that there was no cover for the USB or the Lighting connectors. The casing is plastic but that's not a big issue.